Teddi Schultz didn’t think anything of the turned heads and baffled expressions she received at the crowded summer Ballard SeafoodFest in July. 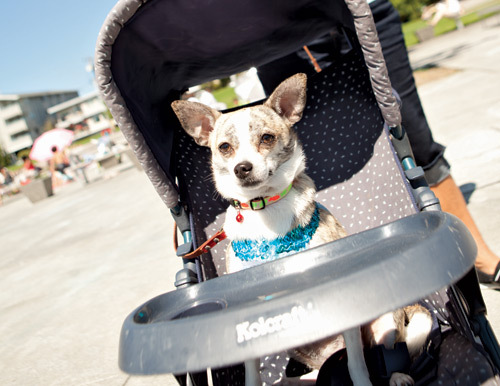 She looked straight ahead proudly, her hands steadying the baby stroller that held her small Chihuahua, Zooey. When asked by a small child if her dog was OK, she explained the dog doesn’t like crowds and doesn’t like getting stepped on. Schultz, who lives in Ballard, says she takes one of her three dogs with her wherever she goes. She also owns a basket full of dog clothes, including a few dog necklaces and wigs that always end up on her pets around Halloween, much to her husband’s dismay. “I’m not sure my husband really understands,” laughs Schultz, who often dog-sits for friends and family, and sometimes has six canines roaming around her house. Schultz is one of many Seattleites who love their dogs—really, really love them. These are people who speak to their dogs in full sentences, even when the dogs appear to be more interested in squirrels than in conversation. They put their dogs in backpacks, in grocery carts and restaurant booths. They put little sweaters on them and, when it rains, little boots. All of this puppy love is creating an explosion of dog-related businesses; with a multitude of new doggie boutiques and doggie day cares, and a gourmet dog-food store on every other corner, we are truly a dogged city. The most recent census numbers available confirm it: There are now more dogs in Seattle than children, by a lot: about 153,000 dogs to 107,178 kids, according to figures from the U.S. Census and the Seattle Animal Shelter. Of course, not all dog owners are as indulgent as Schultz is, but among Seattle dog owners, that human-dog bond is strong. “Most of the time, I let my dog-freak flag fly,” says Shannon O’Neal, a 25-year-old Federal Way merchandising assistant for the very dog-friendly company REI. She is on a waitlist to bring her dog to work at REI’s “doggie row,” a special fenced kennel area just for employees’ dogs. O’Neal also takes her dog, an American Eskimo and keeshond mix named Teton, to “doga” in West Seattle, where yogis practice alongside their dogs. In addition, she writes a blog “for dog moms and dads” about dog products (herdogblog.com), and she included Teton in her wedding (wearing a bow tie) and honeymoon to the Oregon Coast, along with her husband. Thousands of Seattleites are making that relationship official; dog license sales have risen 15 percent within the last 10 years, according to the Seattle Animal Shelter, and local off-leash dog parks are more popular than ever. “There continues to be growth of dog ownership with many more people owning dogs, and the demand for the off-leash areas is growing,” says Magnuson Park manager Charles Ng. Use of Magnuson, the largest off-leash park in Seattle, is on the rise, park officials say. According to their data, there will be about 200,000 dog visits to the park this year—up from the 175,000 recorded the last time anyone counted, in 2007. Seattle’s dog-mecca status is starting to get noticed nationally; it’s considered one of the top 20 destinations in the United States for people who want to travel with their dogs, according to Melissa Halliburton, the founder of Bring Fido, a dog-focused travel agency out of South Carolina. In our socially chilly, introverted city, we’ve also earned the rap that it’s tough for newcomers to make friends here; it’s the famous “Seattle freeze.” We’re just not known for our gregarious nature around strangers. But if a dog is involved, the freeze melts. It’s all smiles, direct eye contact and easy questions like “What kind of dog is that?” and “How old is he?” often followed by the stranger embracing and even kissing your best friend. “I think there is some bigger meaning to it all,” says Steve Ulene, owner of the Barking Lounge, a doggy day care facility in South Lake Union. Ulene says he’s seen continued growth in the dog-care industry, even throughout the recession. He also sees firsthand how important dogs are, both to his clients and himself. Munson agrees that Seattle seems overly infatuated with our dogs, but it’s not necessarily a bad thing. “Yes, we anthropomorphize our pets and we have a large dog population in Seattle,” says Munson, but there are many benefits to being a bit dog crazy. Studies have shown that interacting with a dog not only lowers a person’s blood pressure, but can cause a release of oxytocin, a hormone that promotes bonding and feelings of love, in both humans and dogs. “Whether people want to dress up their dogs, take them to dinner or whatever they want, it is not that unusual or unhealthy unless it keeps you from living your life or hurts you or someone else,” says Munson. More and more, Seattleites are living their lives with dog in tow. On a recent Wednesday evening at Kirkland’s tony waterfront Woodmark Hotel, Lisa Hilderbrand sips a drink while her Italian greyhound/fox terrier, C.J. (short for “Columbia Jane”), scarfs up doggie steak snacks. This is “Yappier Hour,” a weekly gathering for locals and their dogs. Hilderbrand takes C.J. everywhere, she says—even toting her in a backpack while grocery shopping at the Metropolitan Market (she was given the green light by a clerk). Across the lake, at the dog-friendly Norm’s Eatery and Ale House in Fremont, dog owners defend their decision to bring their pets to the table. “This dog is better behaved than some people I know, that’s for sure,” said Mark McCallum, who was sitting out front with his arm around his boxer, Lita. Inside, Norm’s is filled with wagging tails and noses peeking out from underneath tables. McCallum says it works because everybody cooperates and most dog people are conscientious. He only wishes there were more places he could take Lita. In fact, pet dogs are not officially permitted in restaurants or even at sidewalk tables, according to Hilary Karasz with Public Health–Seattle and King County. But, she says, restaurants will not be shut down merely because they allow dogs; it would take a food-borne illness, staff not washing their hands or something along those lines. “It’s not a big health risk, but it’s a potential health risk,” she says. It’s tough to enforce the dog ban, Karasz says, because service animals are allowed within restaurants, and it’s difficult to know for sure which animals are there for service. In March of this year, the Americans with Disabilities Act (ADA) toughened up the definition of a service dog; dogs must now have specific training to qualify. But this change is not expected to decrease the number of dogs brought to restaurants, according to staff at the nonprofit Northwest ADA Center, which fields calls about this topic. The center educates and trains consumers and businesses about the Americans with Disabilities law; about 25 percent of the questions they receive are related to service animals—either from people who want to bring them into a business or from people who want to keep them out. Restaurants like Norm’s walk a fine line balancing these issues. Owner Steve Habecker says Norm’s runs smoothly because most customers follow the rules and any unruly dogs are kicked out immediately. He also makes sure the restaurant is impeccably clean; he says most people enjoy the atmosphere and complaints are few.